From the series Kaiju Manga ( Pictures of Magical Animals), #6, Snakeoil tattoo, printed in an edition of 30. Paper size 21.5 x 29.5 cm. ; image size 18 x 25 cm. "Like woodblock prints, the tattoo has a rich past, often intersecting with other art forms and crossing cultures. In Japan the tattoo has evolved to a high art over the past 7000 years. It is not surprising that the modern form is largely based on the Japanese tradition. With the era of global shipping, sailors returned home with designs from around the world. Most prized were the elaborate and colourful full body tattoos from Japan. These tattoos took months to complete and were poked in by hand using a range of bamboo and steel needles. Many sailors had no chance to undergo the full procedure, so they created a demand for an easier style that still evoked the oriental designs. Smaller pieces were carved into timber and transferred to the skin as a woodblock print. With a needle and ink the print was made into a tattoo. Snakes and dragons were popular subjects. 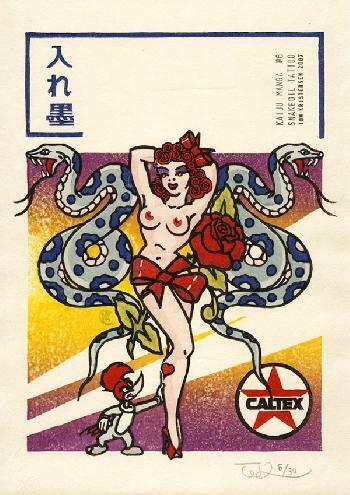 The Japanese tattooists were also woodblock artists working from popular designs. It is likely they also adapted sexualised shunga prints for this new international trade. With the patent of a mechanical needle by Thomas Edison in 1876, the process became a booming business. Tattoo parlours sprung up worldwide in major seaports with their walls papered in loud coloured designs known as flash. After the invention of celluloid films the design were no longer carved in wood but etched onto the plastic surface. The etching was rubbed with a little carbon powder and then transferred onto Vaseline smeared on the shaved skin. This print is based on two pieces of flash art created by Sailor Jerry, or Norman Keith Collins (1911 - 1973) of Honolulu, Hawaii. He was perhaps the most adept American tattoo artist working in the naval style. His work remains popular and influential. Life and death, or love and war, are primary concerns for a military man. A picture of beauty and the beast represents these dual themes."